The Campanian is the fifth of six ages of the Late Cretaceous epoch on the geologic timescale of the International Commission on Stratigraphy (ICS). In chronostratigraphy, it is the fifth of six stages in the Upper Cretaceous series. Campanian spans the time from 83.6 (± 0.7) to 72.1 (± 0.6) million years ago. It is preceded by the Santonian and it is followed by the Maastrichtian. The Campanian was an age when a worldwide sea level rise covered many coastal areas. The morphology of some of these areas has been preserved: it is an unconformity beneath a cover of marine sedimentary rocks. During the Campanian age, a radiation among dinosaur species occurred. In North America, for example, the number of known dinosaur genera rises from 4 at the base of the Campanian to 48 in the upper part. This development is sometimes referred to as the "Campanian Explosion". However, it is not yet clear if the event is artificial, i.e. the low number of genera in the lower Campanian can be caused by a lower preservation chance for fossils in deposits of that age. The generally warm climates and large continental area covered in shallow sea during the Campanian probably favoured the dinosaurs. In the following Maastrichtian stage, the number of North American dinosaur genera found is 30% less than in the upper Campanian. 76.7 mya Montana, USA Orodromeus was a small fast bipedal herbivore that probably coexisted with dinosaurs such as Daspletosaurus and Einiosaurus. 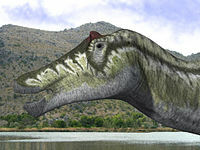 Its length was estimated by Horner & Weishampel at 2.5 metres. David J. Varrichio observes that during the late Campanian Alberta and Montana had very similar theropods despite significant differences in the types of herbivorous dinosaur faunas. ^ Lidmar-Bergström, Karna; Bonow, Johan M.; Japsen, Peter (2013). "Stratigraphic Landscape Analysis and geomorphological paradigms: Scandinavia as an example of Phanerozoic uplift and subsidence". Global and Planetary Change. 100: 153–171. doi:10.1016/j.gloplacha.2012.10.015. ^ Surlyk, Finn; Sørensen, Anne Mehlin (2010). "An early Campanian rocky shore at Ivö Klack, southern Sweden". Cretaceous Research. 31: 567–576. doi:10.1016/j.cretres.2010.07.006. ^ "Abstract," in Varricchio (2001). Page 42.